One of the amazing things about entrepreneurs is their can-do attitude. Most businesses would never get off the ground without somebody saying, "Yes.I can do this" even while everybody around them says "Sure...but better get a job." Entrepreneurs instinctively know the power of "Yes". Yet, once they get going and have employees to manage and books to balance and inventory to track and forms to fill, sometimes that "Yes" gets bogged down into more of a "YesNoWellMaybeHelp!" Do the letters I write simply ooze "Yes"? Do the calls I make with my clients, my suppliers and my colleagues simply ooze "Yes"? Does my website simply ooze "Yes"? 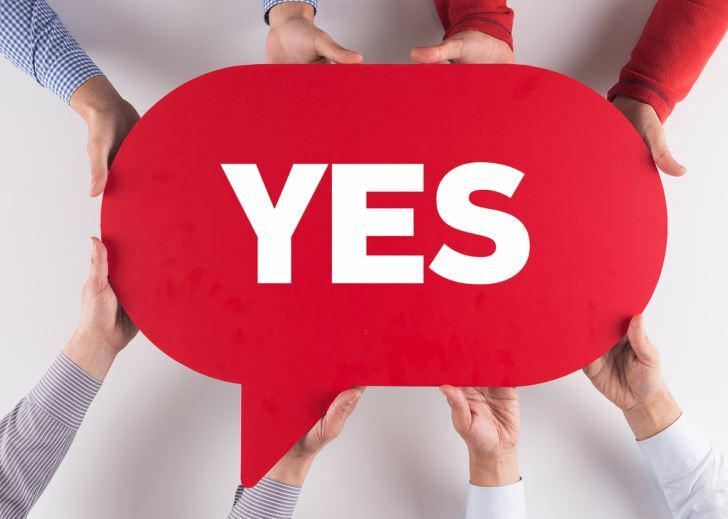 Micah Solomon makes a persuasive case here for making "Yes" a basic part of your company culture.Here is how to do this in your written communications. 1. Always start on a positive note. No mater what you are communicating, make your reader feel positive about your message. You can start by mentioning how much you value the relationship you have with the client, supplier or colleague. This applies equally to a one-on-one letter as to a corporate brochure or other marketing materials. In the case of bad news letters, some people call these "buffers" because they help buffer what the reader does not want to hear. These just a few obvious examples. There are many positive, action-oriented, forward-looking words and phrases to choose from. Again, these are just a few examples of negative or passive words to avoid. 4. Avoid phrases that attack the recipient. For instance, "You claim that..." makes readers feel like you are calling them liars. "You should..." or "We must ask you to..." makes readers feel like you are bossing them around. "You failed to specify..." implies that you are blaming the readers, at very least for being careless. 5. Instead, try using positive phrases that empower the reader. For example, "I see that you reported..." or "If you would be kind enough to..." or "If you could please specify...". 7. Give people options. People love feeling like they have a choice. Empower them by giving them a choice. Be careful, though, research shows that people find too many options confusing. And people have been known to make no choice at all when confronted with too many options. 8. Always be respectful. There are some personalities that are more difficult to deal with than others. Some people love to complain and whine. Some people exude negativity. Your job communicating with them is to treat them with respect, even if you don't feel like it. You won't stop them from being complainers, but you might just win over a fan that stops complaining about you. 9. Don't judge people. This is critical in customer relations, but also in supplier relations and employee relations. People make mistakes, but people are not bad people. If something does not go the way it should, that does not make the person who did it bad. It simply means that they erred.You have erred, too. Focus on fixing the situation and helping others do things right the next time, rather than on blaming the person involved. 10. Keep your tone warm. If you are speaking to someone, he will pick up a lot in your tone of voice. Keep it as warm and friendly as possible to show that you are positive and that you view him positively. If you are writing, you would be surprised how much of your tone slips into your writing. Try picturing the person in front of you, and speak in a warm tone as you write. 11. Smile. Your message extends beyond your words. A smile makes everything you write seem positive. Whenever possible, include imagines in your communications. The very first image to include is a smile.Somewhere in your images, there needs to be a smile. People react to smiles and warm up to them. Smiles help a positive message sink in. Smiles take the edge off a negative message. There is almost no message that cannot be enhanced with a smile. 12. Use the word "Yes". Sure, you can use the word "sure". OK, you can use the word "OK". But why not be precise and say what you mean. Yes, you can use the word "Yes"! Be precise and keep it simple; people don't appreciate overly complex communication. Simple. To the point. Yes! At the end of the day, a happy customer is a good customer and a happy supplier is a good supplier. If you want to be treated well, make sure that everybody you deal with feels well-treated. As Zig Ziglar once said, "You never know when one kind act, or one word of encouragement, can change a life forever." Don't get bogged down in "YesNoWellMaybeHelp! "Stay positive.Keep saying and being "Yes!"